Every now and then, a car comes along that defies convention, and pulls a big middle finger to normality. Dave Best’s 1965 Corvette is one such car, and while it may be new to us, Dave’s owned it and tinkered with it for over two decades now. Mind you, it’s never been as angry as it is in its current guise. 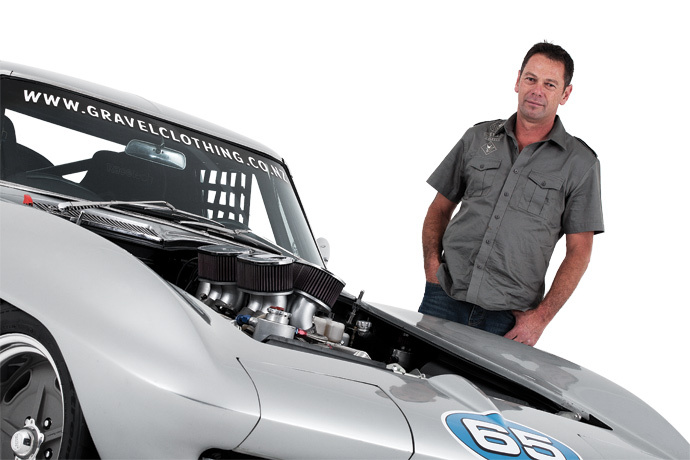 Over the next 15 years Dave was continually playing with the car, and has lost count of the number of different engines it’s had in it, laughing “customers kept buying the engines out of it”, referring back to his days as a Tauranga speedshop proprietor. A lifetime hot rodding enthusiast, he learnt from an early age how to build engines and entire cars, so was certainly not afraid to get his hands dirty on the never-ending project. He wisely knows his own limits though, and when he decided around five years ago that the old girl would make for a cool circuit car, he knew exactly who to turn to. Dave had heard nothing but good things about legendary circuit car builder Mike ‘Bic’ Anderson, another Tauranga local, and he was entrusted with the job. From the outset, Dave said there was no rush, as with time comes perfection, and that’s what Bic has achieved. Dave can’t speak highly enough of his workmanship or knowledge. Dave knew he was never going to mess with the way the car looked; after all, that’s what drew him to it all those years ago. The radiused rear guards give an indication of its drag racing history, while the change to a ’67-style front end shows that many years ago someone tried to make it look newer than it really was. Dave’s pretty sure the aesthetics were done when the car was just a few years old; the silver paint however was applied just over 30 years ago now — not that you’d know it. Bic’s mission to turn the car into a competitive circuit machine was fraught with difficulties, from the small cabin space to the ‘unique’ Corvette rear end that has the axles as a vital suspension component, and which does not improve the vehicle’s handling ability. It’s all in a day’s (or a couple of years’) work for a guru like Bic though, and Dave left him to his devices to apply his ingenuity as he saw fit. The suspension side of things was a major, and one of the more time-consuming aspects of the project. The solution to the car’s inherent problems was to create slip-joint style half-shafts, which would increase and decrease in length through the suspension travel. When combined with an extra suspension link, and set up to perfection on a computerised suspension analysis programme, the result is genius. Of course, the basics, such as fitting adjustable shocks and a Guldstrand transverse leaf spring, were also taken care of. The modified rear arches allowed for the track to be widened for optimum road-holding ability, too. Up front Guldstrand springs were added, along with optimised double A-arms, a custom chromoly sway bar, and a rack and pinion steering assembly, the latter powered by an electric pump. In preparation for Dave’s powerplant of choice, a dry sump tank was mounted as rearward in the engine bay as possible — and a custom fuel system fitted as far forward as practical. While Bic was sorting out all the little time-consuming parts that go into a major build like this, Dave was busy assembling the motor. Like the car itself, he’s owned the motor for many years, and although tempted to sell it at times, he has managed to hold on to it. After building it with various combinations, he knew exactly what was needed this time around — and that was mechanical fuel injection. While the naysayers say it can’t be done on a road car, and that tuning is impossible, Dave disagrees, and thanks to the perfectly tuned Hilborn injection system on the Corvette’s 410ci sprint car motor, he’s got the proof for his theory. Dave built the engine around a bow-tie block, with 13.2:1 compression to make it street-friendly, albeit on avgas. The rest of the engine specs read like a dream list for most engine builders: Brodix dash-12 15-degree heads, splayed caps, LAE Kryptonite crank and rods, Jesel shaft rockers — you name it, it’s got it. The headers, which could double as an objet d’art, are more of Bic’s handiwork and are stepped from 1 7/8-inch to 2-inch into a merge collector followed by a full 3-inch system, and, as you can expect, the sound is raucous. The driveline that backs it all up is equally as well thought out, and while predominantly aimed at taking abuse on the track, it’s streetable, but not for the faint-hearted — then again, driving any mechanically injected car on the street takes a bit of getting used to. A Tilton 7-inch clutch acts as the on/off switch from the Jerico 4-speed manual straight-cut dog box. Further back you’ll find a Duntov heavy-duty Eaton Posi with 3.08:1 ratio, and the aforementioned custom half-shafts. One of the finishing touches in the build was the wheel combination. Too small and they wouldn’t fit over the Wilwood 6-pot front calipers and 13-inch rotors, too large and they’d ruin the classic appeal of the C2’s bodylines. The perfect solution was found in the form of 17×9.5-inch American Racing Salt Flat Special wheels, which are wrapped in 275/40R17 rubber. The vehicle’s widened track brings the tyres ever so close to the guards, yet somehow they don’t hit at all. While the car hasn’t made it onto the circuit for a shakedown yet, with the engineering finesse and thought that has gone into the build, we can only assume it will be an impressive sight. But what class will it race in? Dave’s not too sure, and to be honest, he’s not really that fussed. He built it how he wanted it rather than how someone else told him to, and if that leaves him relegated to track days and street driving, then so be it. With a new business venture — Gravel Clothing — now underway, time is at a premium for Dave, so fully committing to a race series would be a long shot at present anyway, but we can’t think of any better way to market a clothing brand aimed at car enthusiasts than slapping the name on the side of one of the coolest cars in the land. If you love the car as much as we do, then we recommend you check out the Gravel Clothing website; you never know, but you may just find it on a T-shirt … and while it’s not as cool as owning the real thing, it’s about as close as you’re ever going to get.